Passage West (informally called, Passage) is a port town about seven miles east of Cork with a population of approximately 5,000 inhabitants. While there is no official Baptist church there Shane Deane (Baptist Missions) works in partnership with the Douglas Church. Together, they look for opportunities to reach into the community. Their long-term vision is to plant a church. 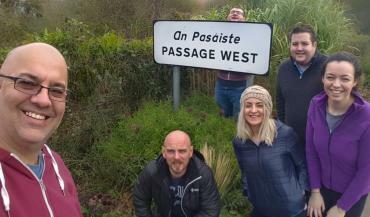 Six team members met on Saturday, 22 October and after a fried breakfast, headed off to Passage West. The week started as soon as we arrived - we spent the evening with Douglas Church youth. What a privilege it was to meet such an enthusiastic group of young people and study Psalm 1 together. For us, one of the main encouragements of evangelism week was getting to know the members of the Douglas Church. Their desire to reach into their community was inspiring.The team spent time delivering invitations to a special Kid’s Club and Harvest Service in Passage planned for Friday night, 27 October. The highlight of our week was seeing local children come to the kid’s club and learn the Parable of the Sower. Later that evening, the hall was nearly full for the Harvest Service - several people the team had met during the week were there.Thanks to Shane and Luana for organising the week, to those who (over) fed us and to Cathy and Tim for their hospitality.